(May 2016) Milena Pepe, CEO of Tenuta Cavelier Pepe, swept across the front porch of her winery to greet us with open arms and a huge Italian welcome. The winery, located in the rolling hills of Campania, looked like a small palace with tall white pillars along the front and the vineyards beyond. Milena beckoned us to line up on the porch for a photo, and then for the next two hours, she proceeded to dazzle, delight, and inform us about the unique wines of Campania and the many indigenous grape varieties she is using at her estate. We arrived at Tenuta Cavalier Pepe in the afternoon. Piero Mastroberardino recommended that we visit the estate because it was only a 30-minute drive from his winery, and he thought we would enjoy visiting a vineyard in the country. He was right, as the drive was breathtaking with green hills covered with vineyards, olive orchards, and red poppies. The sky was a soft blue, and the craggy mountains and cliffs that surrounded the gently rolling hills reminded me of Piedmont. Every so often we passed a tiny village nestled in a valley. After greeting us, Milena escorted us to an aglianico and falaghina vineyard, describing the natural viticulture processes, and stressing how important it is to be able to taste the authenticity of the land in the bottle. She explained that her father was Italian and had owned the vineyards for years, but had traveled to Belgium where he had met Milena’s mother and stayed there. Therefore, Milena grew up in both Belgium and Italy, and eventually, in 2005, decided to stay in Campania and start a winery. She studied winemaking in France, and then began construction of the large and impressive winery with its beautiful tasting room. Further up the hill, she also built a restaurant and a small resort hotel. Today the winery produces 300,000 bottles from 50 hectares of vineyards. She oversees 18 employees, and is very well connected in Campania. In fact, she is also the president of the Campania DOCG Consortium, is married, and has two small children. In our short time with her, we came to realize that she is passionate, very extroverted, brilliant, and stressed from too much work. Milena built the wine brand of Tenuta Cavelier Pepe from scratch, focusing on local indigenous variatals such as aglianico, fiano, greco, falanghina, and the rare copa di volpa grape. She oversees all of the marketing, public relations, and social media campaigns as well. Her efforts have paid off, because today she exports 50% of her production to 25 countries. 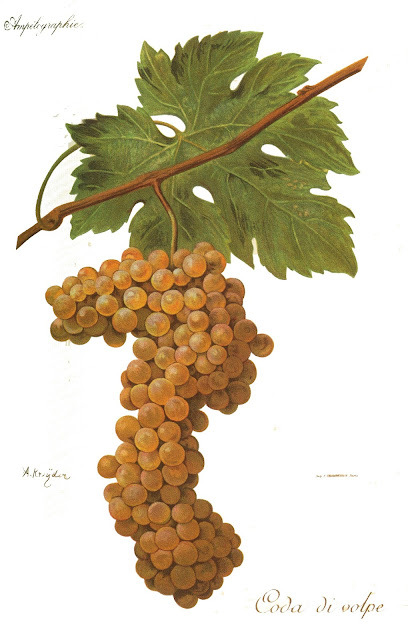 2015 Tenuta Cavalier Pepe Coda di Volpe– a very unique white wine named after the “tail of the fox,” due to the very long grape clusters it creates (see photo). The nose was a subdued almond and lemon, which followed through on the palate with some hay and herbal notes. Medium bodied with medium acid and very textured on the palate. 2010 Tenute Cavalier Pepe Opera DOCG Taurasi (Aglianico) – this was my favorite of the tasting. A beautiful aglianico with classic notes of earth, dried cherry and spice. Lots of pepper on palate with huge tannins, and a very long finish. Amazing! 2009 Tenute Cavalier Pepe La Loggia Del Cavaliere Reserva Riserva, Taurasi (Aglianico) –Very decadent and international in style, but still extremely appealing. Oozing gobs of expensive French oak on the nose with cedar, tobacco and spice. On the palate the black dried fruit and tar of aglianico showed through with more spice and herbs. Extremely concentrated, with massive tannins, very complex, and a finish that lasted for ever. Apparently this wine scored 95 points at the Decanter World Wine Awards this year (2016), and was named "Best Red in Southern Italy over £15." This type of recognition has helped to put Tenute Cavalier Pepe on the map. After the tasting, we all rushed into the tasting room to purchase wine. The employees were very professional, and we greatly enjoyed our visit. Milena followed us out to the front porch to wave good-bye, and encourage us to return again. I definitely hope to so, and next time stay at her lovely resort on top of the hill.